Now that the LG G3 has been introduced, we are learning more about some of the cool features on the phone. 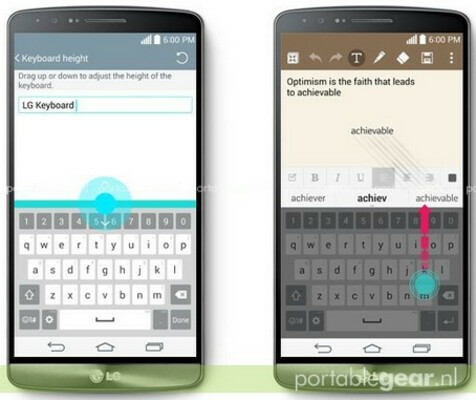 For example, LG's new flagship handset will be equipped with a "Smart Keyboard". 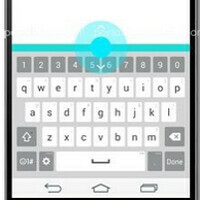 What makes this virtual QWERTY so intelligent is that it learns how you type. For example, if you usually type the letter "S" when you mean to hit the "A" key, the keyboard on the LG G3 will stretch out the "A" key sensor so that you are typing the correct word. This is the same feature available on the BlackBerry 10 QWERTY keyboard. The size of the LG G3 keyboard can also be changed to better fit the size of the user's fingers. The keys can be stretched out or compressed, and the symbols on the side of the space bar can be changed. The experience of typing on a touchscreen phone has improved over the years, mostly due to the larger screen sizes available on Android and Windows Phone models. Now, virtual QWERTY keyboards are learning more about your typing skills and how they can adjust to make typing easier, no matter how big or small your fingers are. WP 8.1 Word Flow is better, but I'm glad LG is stepping it up. WP8.1 keyboard is just that. You are stuck with the one keyboard. With Android you have many choices, and none on WP. LG is now letting you size the keyboard. Can WP keyboard do that? Don't need to answer. Its a No. Google Keyboard for life, that is one of the first things I change when I get a new phone. I like how you can make the keyboard bigger or smaller height wise. Nice feature for the stock LG G3 keyboard. There are other keyboards that will allow you to do this as well. They are on the play store. could you mention some here? Cant wait till this is ported to other Android phones....liking this. Both of these features are in fact in Sony's homebaked POBoxTouch "XPERIA Japanese keyboard". At least since September.